When Oak Hills defeated Apple Valley 37-7 in the Mojave River League opener Friday, there was reason for initial celebration. But that celebration turned to concern shortly after the game. Oak Hills retreated to the south end zone as the coaches met with the players after the game as usual. After that, players and coaches began to disperse. Junior Aaren Villella, a backup linebacker, stopped on the field, sat on the ground, then laid down. With trainers already leaving the stadium, they had to be called back to tend to Villella. He complained of being “short of breath, dizzy,” said coach Artie Allen, who believed Villella played a little, late in the game. Allen said Villella also complained of chest pains as well. He was told by Villella’s parents that their son had previously had a heart-related procedure and that this was likely related to that procedure. Villella was eventually taken to Loma Linda University Medical Center, then later to a Kaiser facility to have tests done. Allen said Villella was not back at Oak Hills as of Wednesday. The Hesperia football program will forfeits tonight’s Mojave River League game against Oak Hills after a group of Hesperia student-athletes vandalized the football stadium, according to the Victor Valley Daily Press. In the report, Bulldogs’ head coach Robert Kistner said the Hesperia players had spray-painted an expletive on the field, defecated in the bleachers and egged the Oak Hills’ press box. The Bulldogs conclude the regular season at 5-5 overall and 4-1 in Mojave River League play. The Scorpions finish at 3-7 overall and 1-4 in the MRL. Alta Loma’s Alex Nunez talks about the approximate 20-min delay before his consolation match Saturday that clinched a spot in the top 8. Oak Hills junior Jesse Madrigal wrestled in the semifinals Saturday, but lost, then lost 2 more while dealing with a hamstring injury and had to settle for 6th at 220 pounds. He was also outweighed by many of his opponents by about 20 pounds. 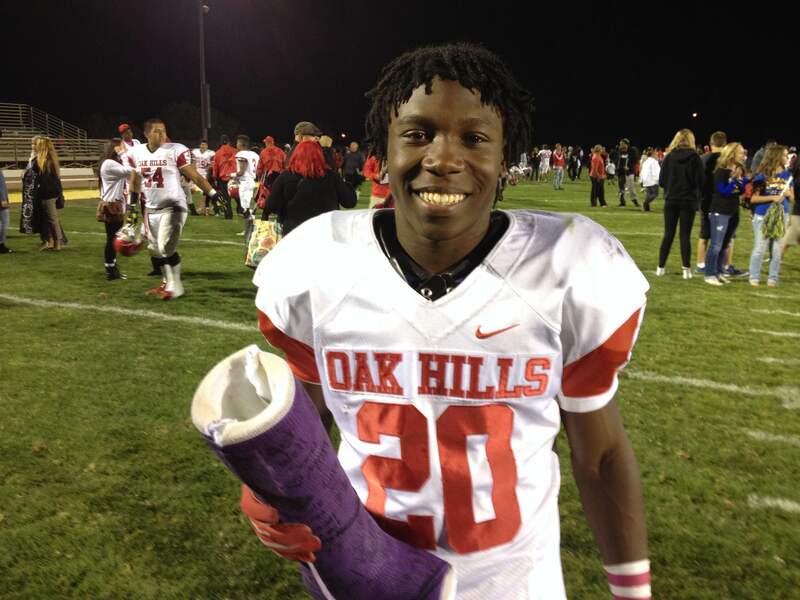 DeZhontaey Fletcher, the senior RB from Oak Hills proudly displayed his cast after beating Serrano. Why? If you read my feature story on him a few weeks ago (here it is: http://bit.ly/1rwFUwm) you’d know that Fletcher broke his ankle in the Serrano game last year. It was on the very first play of the game, it ended Fletcher’s season, and Oak Hills lost the game and a chance at the Mojave River League title. This time, Fletcher decided to bring the cast to the game (he doesn’t usually do that), to remember what happened a year ago. Now he can forget about last year as Fletcher ran for 163 yards and a touchdown in Oak Hills’ first-ever win over Serrano, 24-21. Could San Gorgonio-Oak Hills result be best for both? Last week, Oak Hills was impressive in knocking off my No. 1 team, San Gorgonio and giving the Spartans their first defeat of the season. I think this could be good for both parties involved. Last year, San Gorgonio went into the playoffs with a 10-0 record but came up short in a semifinal loss to Riverside Norte Vista. The Oak Hills game should be the last time the Spartans are tested. Had San G. cruised to a victory, it would not surprise me for San G to lose some intensity, an intensity the Spartans might not get back in time for the latter playoff rounds. The loss makes them realize how vulnerable they are and what they need to do in the long run. As for Oak Hills, the knock on the Bulldogs is that they’ve been good, but haven’t been able to come through in the big game. They haven’t beaten perennial Mojave River League rival Serrano yet, and Oak Hills has never been past the second round of the playoffs. Now, next week’s game against Serrano will be bigger than the San G. game, but the San G. game proved one thing: that Oak Hills can win a big game. The teams won’t see each other again this year, because they are in different playoff divisions. But they could both look back at that game as important in driving them toward a deep playoff run. I love games where there’s a lot of extra stuff to talk about afterwards. Oak Hills- Serrano had stuff that was fun to talk about, but also had plenty of stuff you hate to have to talk about. Great crowd at Oak Hills on both sides. It was THE game in the High Desert on Friday and fans from all over brought a great atmosphere. Serrano’s win was well-deserved with a defense that has been solid all year. What is the fallout of the game? I haven’t seen newest CIF-SS football polls, but I know San Gorgonio is very interested. San G. should be the new No. 1 in the Eastern Division. Oak Hills was No. 1, San G. No. 2 and San G. is the only remaining undefeated team in the division. San G. will likely need to remain undefeated to earn the No. 1 seed for the playoffs. Oak Hills star RB De Zhontaey Flecher was injured on the first play from scrimmage with an apparent season-ending ankle injury. It was a blow to Oak Hills, certainly, but also affected Serrano. The Diamondbacks’ victory will be discounted by some because Oak Hills was missing its biggest offensive weapon. But Serrano still deserved to win. After the injury, Oak Hills rallied to take the lead, only to see Serrano rally for the win. Penalties, penalties, penalties. Each team had over 100 yards in penalties. I spent a half on each sideline, and I can tell you neither coach was happy with the officiating. The call that drew particular ire of Oak Hills coach Robert Kistner was an unsportsmanlike conduct call that went against his team in the fourth quarter. The player had just recorded a sack that (I believe) would’ve ended a Serrano drive. He celebrated, but officials thought it was taunting. It did not appear so to this observer. The drive continued and while Serrano didn’t score on the drive, it limited the time Oak Hills had to try and score in the final minutes. Here are videos from the last 2 days of 3 CIF championship games. The below video shows the final out for Mesa Grande in a 16-7 victory over Southlands Christian in a CIF-SS Division 7 championship softball game. Video No. 2 shows the final out for Aquinas in an 8-1 victory over Montebello in a CIF-SS Division 5 championship softball game. Video No. 3 shows Citrus Valley scoring the tying run with two outs in the top of the seventh. That’s the final out of Oak Hills’ CIF-SS Division 5 semifinal win over Ontario Christian, 5-4. Although it was a tight game, there was not nearly as much drama as Ontario Christian’s quarterfinal win over Templeton when the Knights recorded a triple play and got the benefit of a call when a Templeton runner failed to touch home plate. This time, the big difference was extra-base hits. Oak Hills had nine hits, including four doubles and a home run. Ontario Christian had seven hits, all singles. Here is how things shape up for Sun baseball and softball teams in the CIF-SS Finals. Toughest draw: Matt Williams, Sultana (182) and Kenny Clark, Carter (285). Williams, ranked No. 7 has an easy first-round match, but then would face the No. 3 ranked wrestler in the second round and likely the No. 8 wrestler in the third round just to get to the quarterfinals. That’s a loaded section. Clark, also ranked No. 7, should have an easy second round match, but would face No. 1 Nick Nevills of Clovis in the third round. Someone was going to be unhappy when Griego defaulted and took 6th at CIF-SS Masters. That person is Jonathon Costa of Escalon. Costa, ranked 10th, will face No. 1-ranked Griego. Best chance to place for someone ranked outside of top 8: Garrick Gurney, Chino Hills (170). Gurney, ranked 13th, doesn’t have to face anyone higher than No. 12 en route to the quarterfinals. San Bernardino County is sending a total of 17 wrestlers to state after Saturday’s CIF-SS Masters Meet. 220: Derrick Jones III, Jr., Bloomington, 1st at divisionals, 1st at Masters, ranked 2nd in state.